Stuff N Nonsense was reinvented in memory of my Mom. Stuff N Nonsense was originally the business of a talented, juried crafter. My interest was not in sewing and soft sculpture. I was much more interested in the older pieces that had a story to tell so when I left the first of my careers. 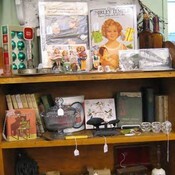 I began buying and selling at flea markets and antique shows. I continue to do real time selling as I am working to revive online business here at Bonanza. The inventory in my booth is varied, an eclectic mix of the old, the new, the antique, the vintage, mid-century modern, the contemporary as well as the gently used. All of the inventory was handpicked by me. My weekends are spent scouring auctions, flea markets, estate sales wherever the antique trail leads me. I love each of my pieces and I try to investigate the story of each purchase. Because I do participate in real time selling there is always a possibility that an item you want has been purchased in real time. I work very hard to make sure this does not happen but I want to be totally transparent with all my future customers. You can get MUCH BETTER PRICES,VERY GOOD DEALS if you come see me at a show in Vermont and/or New Hampshire because I don't have to pay shipping. I have a small space in a wonderful group shop called Countrychiqueantiques which can be found in Woodsville, NH. This winter you might find me at the Montpelier Antiques Market or the Milford, NH Antiques Show. krenfrew doesn't have any items in their booth! Thank-You for stopping by by booth, sorry i missed you. Stay warm there in Vermont. Thanks for stopping by my booth and tagging my painting as beautiful. Nice to have another Vermonter to connect with here! Thanks for visiting our booth! Thank you for the fast prompt payment! You are welcome anytime!